The house is situated in Cesarica Angela Karlobag quietly located on a dead end and about 400 meters from the coast road to the sea or Beach and is ideal for guests who are looking away from mass tourism rest and relaxation. The apartment Top 2 on the 1st floor with its own staircase can accommodate 4 to 6 people and has a kitchenette (dishwasher, crockery, coffee maker) with dining area and living room with pull-out sofa bed and flat TV-SAT. One bedroom is furnished with a double bed and wardrobe, the second bedroom has two single beds. Furthermore, the apartment has a bathroom with shower and double sinks and an extra toilet. 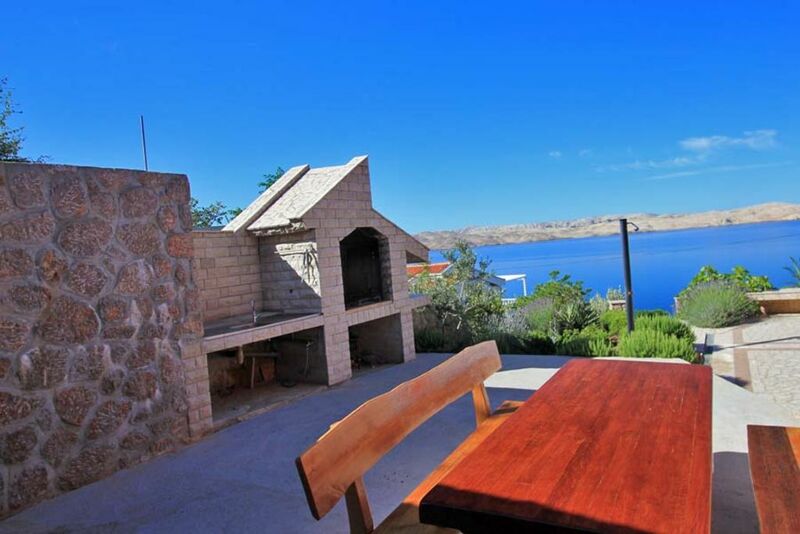 The large terrace offers a magnificent view of the sea and the island of Pag. Sun protection and patio furniture on the terrace. Air conditioning and Flat Sat-TV and dishwasher are available. Sheets and towels are provided with weekly change. From the house or Gardens via stairway to the sea where there is a small shallow cove for children. You can also use the garden of the house, a barbecue available. Parking is available in front of the house or on the property in front ..
Wireless internet is available and included in the price. On the ground floor and 2nd floor are the apartments Top 1 and Top 3. The large terraces offer a breathtaking view of the sea and the island of Pag and invite you to relax, eat and relax. The swimming spot with the character of a private beach in a small cove can be reached from the house via a staircase. The center of Karlobag is about 6 km away from the house, where you then shops, bars, cafes, bank, post office etc.,find. The nearest shop, kiosk for the breakfast bread and three restaurants are about 800 meters away from the Haus Angela. In addition, boat trips are on offer at the nearby islands, with Captain Branko Fischpicknik in a small bay on the island of Pag, hiking and climbing in the Velebit mountains with an experienced mountain guide or diving courses. The visit of almost 30th 000 square meter nature reserve Plitvice Lakes is an unforgettable experience. The Plitvice Lakes are equipped with beautiful walking paths, so that they can be visited for its magnificent natural and the access to the lakes in all seasons. Die Wohnung ist sehr geräumig und gut ausgestattet. Ideal für 3-4 Personen. Die große Terrasse mit Blick auf das Meer lädt zum Grillen ein. Insgesamt ein sehr schöner Urlaub. Sehr saubere, großzügige Wohnung mit toller Terrasse. Die Aussicht ist wunderschön. Die Vermieter sind sehr nett. Wir hatten eine wunderschöne Zeit. Unsere Familie hat den Aufenthalt sehr genossen. Wegen der vielen positiven Bewertungen im Internet diese Wohnung gebucht - und was soll ich sagen, Volltreffer. Alles so vorgefunden, wie beschrieben und gelesen. Netter Empfang, große und moderne Unterkunft, der Meerblick unbeschreiblich und die Terrasse ein Traum. Tolle Landschaft, die Gegend touristisch noch nicht überlaufen. Un emplacement et une vue magique pour des vacances au calme ; nous disposions de l'appartement (design et très confortable) avec la terrasse attenante. La petite plage privée est appréciée. Karlobag est bien placé pour rayonner sur la Dalmatie du Nord et les parcs naturels. Anita a été très disponible et réactive lors de nos échanges mail. Un accueil très courtois et sympathique de Igor lors de notre arrivée, de plus très tardive. Tolle Ferienwohnung in ruhiger Lage, nicht weit zum Strand und Meer mit super Terrasse, es passt einfach alles und wir fühlen uns bei der Vermieterfamilie und in Cesarica einfach wohl. The holiday Angela is located on the beach / sea quiet at the end of a dead end. From the terraces and entire property you have breathtaking sea views. In Karlobag you will find several small markets, bars, cafes, bank, post office etc. There is also the possibility of boat trips to the nearby islands of Rab and Pag or hiking and climbing in the Velebit mountains with an experienced mountain guide. The proximity to the Velebit mountains allows you to spend your Croatia holiday by the sea and in the mountains. The crystal clear and clean waters of this stretch of coastline in Croatia are a paradise for snorkeling and diving guests. In addition, Karlobag is surrounded by 4 national parks, the islands of Pag and Rab, the cities of Zadar or Senj and the sacred mountains of Croatia, the Velebit. Visiting the nearly 30,000 square meter nature reserve Plitvice Lakes is an unforgettable experience. In addition, there are great boat trips to the nearby islands of Rab and Pag, hiking, guided mountain tours by jeep and mountain biking in the Velebit National Park and Paklenica and much more. Other worth seeing destinations are the Krka waterfalls and the Kornati islands. Die Klimaanlage ist nicht im Preis inkludiert und wird vor Ort bei Benützung extra vom Eigentümer verrechnet ( € 5.- pro Tag). Kurtaxe wird extra vor Ort berechnet.